So the other day when a friend at the gym spoke about his carving for Chocolate Donuts, I realised I hadn’t cooked these goodies in a while! A date was set for the coming weekend.The husband was out-of-town and it was the perfect time to experiment! Out came the silicon donut baking tray and my instant yeast. I’ve been using DCLs instant yeast for the last 5 years and am pretty pleased with the results as you will see from the pictures! 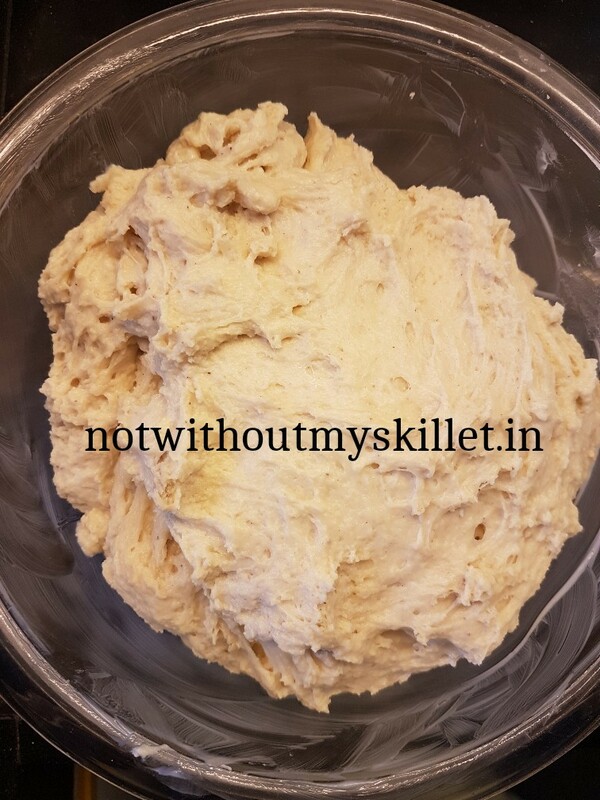 The recipe has been adapted from the recipe posted by melskitchencafe but I’ve substituted the all-purpose flour for a mix of barley-oats-all purpose flour in equal proportion and added a bit of baking powder to help it rise! 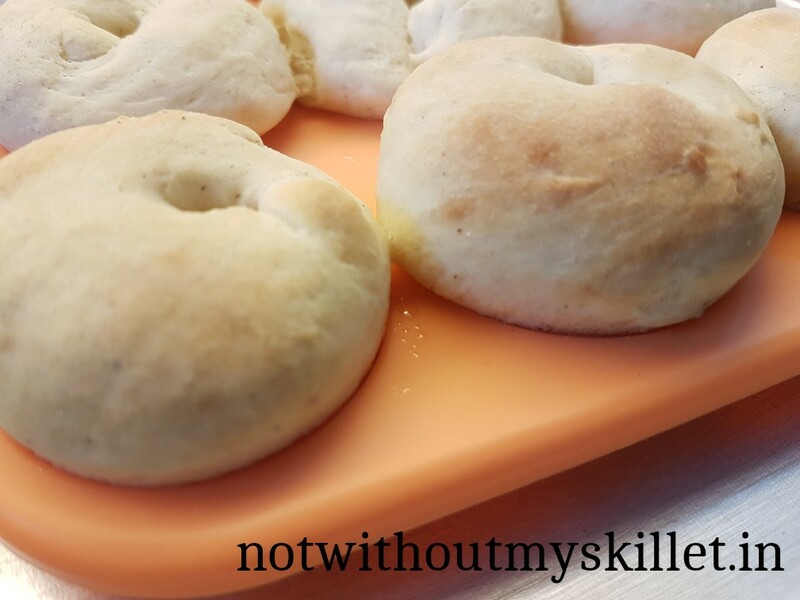 These are best eaten straight out of the oven! I don’t use a microwave, but I guess zapping them if they’re cold would be the next best alternative! 1. You need to start with the yeast. If you don’t have a cooking thermometer, (I don’t) warm the milk to a point where you can immerse your finger in it, it should be hot but not stinging hot. Pour it into a mixing bowl, add the yeast, sugar and mix it well. The yeast feeds on this sugar to bloom, so this can’t be substituted. 2. Now add the eggs, freshly grated nutmeg and stir well. 3. Add the flour, you can either use the dough attachment or use your hands to mix the flour in. I’ve used my hands. 4. 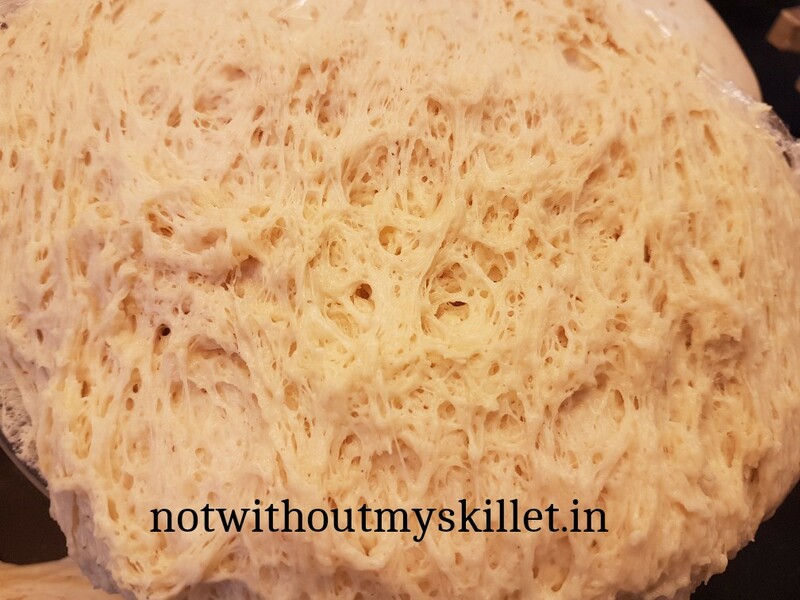 Knead the dough till it sticks to the edges of the bowl but comes away clean from it too. It should be sticky, light and stringy. I’ve used the butter at this point and not earlier on as was used in the recipe. It helped keep the dough off my hands. 5. Place the dough in a greased glass bowl in a warm place to proof. It will rise to almost double the quantity so use a bowl for the right size. Also if you cling film the dough ensure its not to tight, check on it in 30 minutes and if need be loosen the film as you go along. The dough rose a bit too much and was out of my glass bowl! 🙂 I love this net…you know you’re going to get a good bake if you see this beauty! 6. Once the dough has risen or in an hour, push it down again. This can now be used to make the bread of your choice. I’ve also made a cranberry, walnut and raisin bread from the same bread mix. 7. Grease your silicon donut mould or donut cutter and silicon mat. This has been shot mid-way between the second proofing…the dough was flat when it was first filled into the mould. 9. 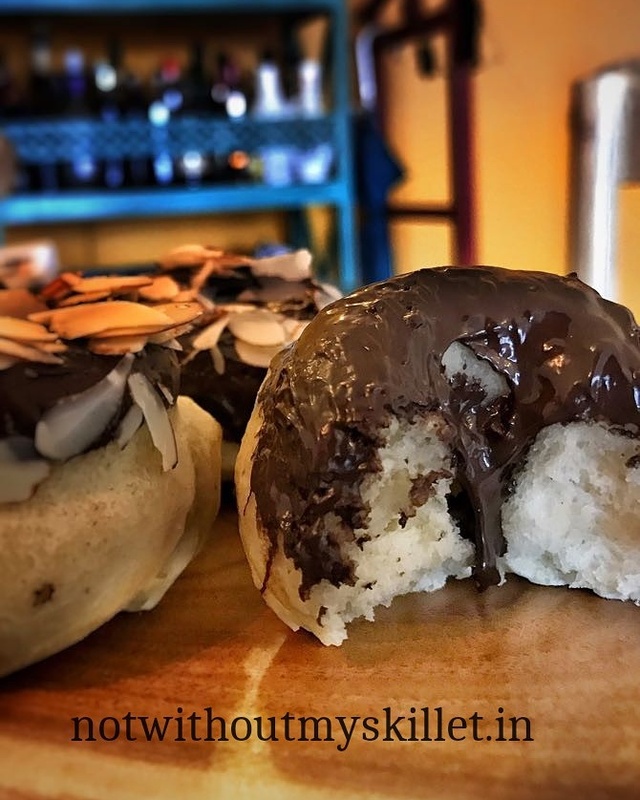 If using a donut mould, pull small balls of dough and shape it into a log, place it in the mould and join where the dough meets. 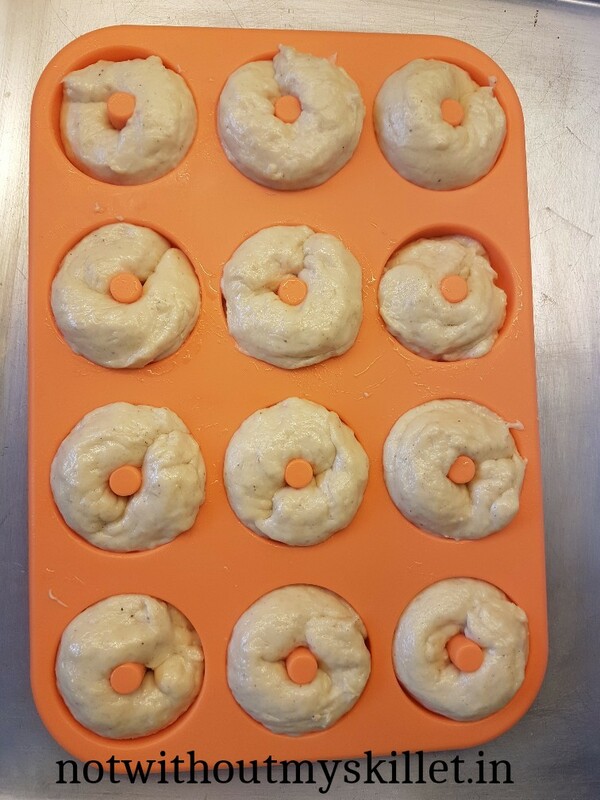 If you’re using a donut cutter, roll the dough on a floored surface, to about 1/2 inch in thickness and cut the donuts using the cutter, place them on the silicon mat, make sure you keep enough space between two donuts as they will double in size during the second proofing. 10. Place the donuts in a warm place, cover then and let them rise a second time. About 20-25 minutes. Baked and ready to be dipped into chocolate ganache! 12. Meanwhile, in a double boiler melt the sugar-free chocolate compound and keep it ready. In a bowl place the sliced almonds. 13. 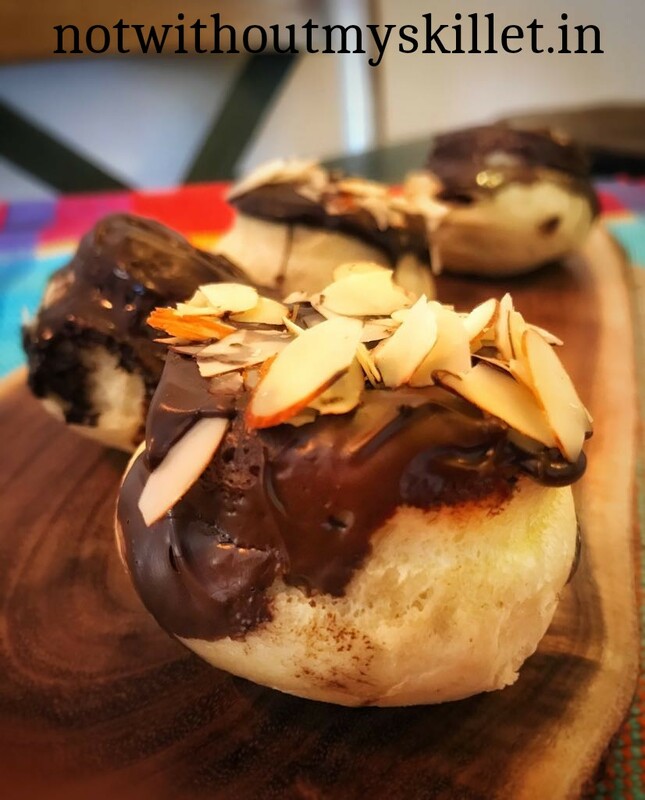 Once the donuts are done, take them out and dip them in the chocolate and scatter the sliced roasted almonds on top. Enjoy your sugar-free healthy donuts! The dough can be made and placed into the refrigerator at the stage of the second proofing. That way you can bake a fresh batch of donuts just before breakfast or lunch!